It’s quite the wintry day today and I couldn’t really be bothered to cook anything too complicated for lunch. Hence the quiche. I could, in theory, make my own puff pastry. But the whole point of making a quiche this afternoon was that it was going to be quick and comforting. This has been quite successful so I’m quite happy to share it. Unroll pastry and lay over a 25cm loosed based round flan tin. Once the flan tin is lined, put back in the fridge while you prepare the filling. In a sautee pan, heat up olive oil and add minced onions and sautee. Once onions turn transluscent, add garlic. Stirfry the garlic and add the bacon. Once bacon is golden brown, add the spinach and cover to wilt the spinach. This should take about 2 minutes. Once spinach is wilted, give the mixture a gentle stir. Put the lid back, take of the hob and set aside. In a mixing bowl beat eggs well and add single cream. Spoon 1/3 of the spinach and bacon mixture into the cream and egg mixture to temper the eggs. Mix well and then add the rest of the spinach mixture. 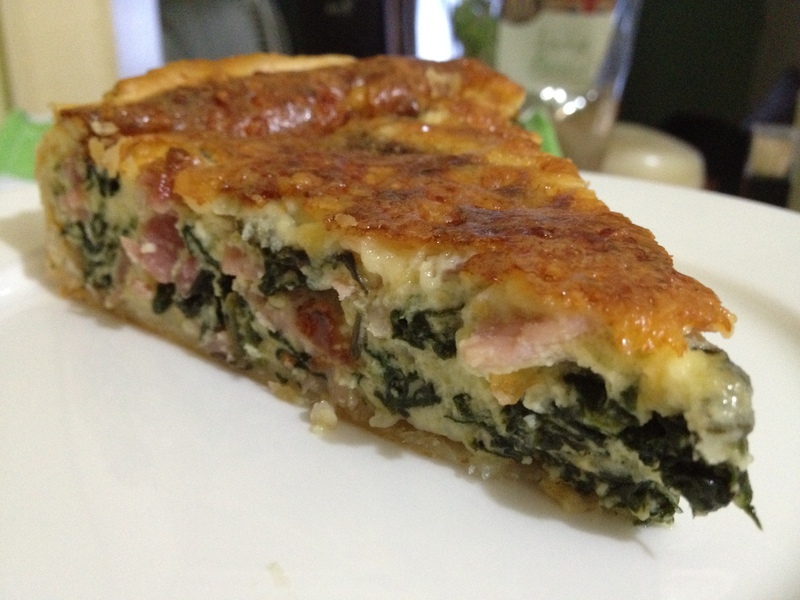 Bring out the pastry-lined flan tin and fill the pastry with the spinach-milk and egg mixture. Top with the grated cheese. Bake in the oven for 35-40 minutes or until the cheese is golden brown. TIP: To avoid the now infamous “soggy bottom” and because you are putting in quite a liquid mixture and a soggy bottom is almost inevitable, I find that putting in a baking sheet in the oven while it’s preheating will help the soggy bottom from not being too soggy. Once you’re ready to bake the quiche, just slight the flan tin onto the baking sheet. This is exactly the recipe I needed! I’m having a smal gathering in a few weeks and want to serve 2 different quiches. I make a good crab one, but lacked a spinach one…. thank you! You’re very welcome. This works really well, but to make it less rich you could reduce the cream or replace it with half the amount of milk 🙂 Let me know how you get on! Would love feedback on the recipe!